What is a ureteropelvic junction obstruction? 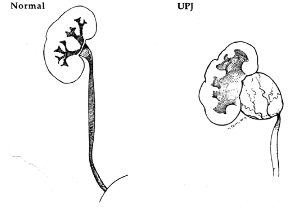 A ureteropelvic junction obstruction (UPJO) is a blockage of urine flow from the renal pelvis to the ureter. The renal pelvis is the part of the kidney that collects the urine made by the kidney and the ureter is the tube that carries the urine from the renal pelvis to the bladder (see figure 1). The blockage seen in UPJO is thought to be caused by a congenital narrowing of the ureteropelvic junction or less commonly by compression of the uteropelvic junction by a blood vessel to the kidney. The blockage can be partial or complete with varying degrees of severity. About one child in every 1000 births is diagnosed with a UPJO. What are the symptoms of a ureteropelvic junction obstruction? A UPJO may be asymptomatic and be diagnosed only from imaging studies. Often times a UPJO is suspected before birth on screening ultrasound that show a kidney that is very dilated. Occasionally a UPJO will cause episodes of flank pain and nausea. In addition, children with UPJO may present with a urinary tract infection or a kidney stone. How is a ureteropelvic junction obstruction diagnosed? A UPJO is often suspected when an ultrasound shows a dilated kidney. The diagnosis is confirmed with a special radiology test called a lasix renal scan. A lasix renal scan tells you how well both kidneys function relative to one another and how well the urine drains from the renal pelvis to the ureter. Another test called a voiding cystourethrogram is also occasionally performed to evaluate for reflux or backflow of urine from the bladder to the kidney. How is a ureteropelvic junction obstructed treated? A child with a partial UPJO and a good functioning kidney with the partial obstruction can often be treated just with observation. This involves obtaining serial ultrasounds to follow the dilation of the kidney and less frequently performed serial lasix renal scans. A large percentage of children with partial UPJOs will grow out of them. Occasionally the x-ray tests worsen, or the child has a urinary tract infection and surgery is needed. Surgery is generally needed for a complete UPJO and for a partial UPJO that is worsening or having complications such as UTIs. The surgery is called a pyeloplasty, which basically means reconstruction of the ureteropelvic junction. A small incision is made on the side of the child and the narrowed part of the ureteropelvic junction is removed and the pelvis and ureter are sewn back together with a wide channel. The surgery is very successful are getting rid of the UPJO. Please see the handout on “pyeloplasty” for more detailed information. Why are ureteropelvic junction obstructions treated? Kidneys with UPJOs are at increased risk for infection and kidney stones. Most worrisome is that a UPJO over time can damage a kidney and decrease the amount of function that kidney has. After a pyeloplasty, the child’s kidney will be monitered with renal ultrasounds. Because the kidney was dilated prior to surgery, some residual dilation is normal and expected. As long as the kidney is growing, the dilation is stable, and the child is not having complications such as UTIs no further treatment is needed. The renal ultrasounds are generally done every few months after surgery for a while and then are spread out to once every few years then eventually stopped. Children who have had surgery for UPJO can participate in all sports like normal children and the vast majority live normal lives.